No program would be complete without the opportunity to create and perform. Our artist workshops provide the perfect setting for children as they participate in drama camps, puppet shows and other visual arts, dance and performance activities. Breanna’s Gift sponsored a fused-glass workshop led by FOCI, the Minnesota Center for Glass Art. The kids made sun catchers and their creativity came through immediately. Working with small pieces of glass can be tricky, so everyone had to wear thick gloves. This challenge didn’t hold anyone back and it’s always great to see the kids dig right in. 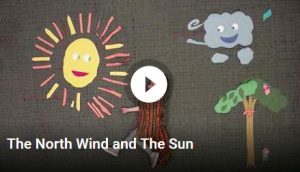 Our recent animation workshop required a story, large drawings cut into pieces that could be manipulated, actors and lots of patience. It’s a very slow process because the animation consists of several frames of the same images being moved ever so slightly, multiple times. This latest workshop offering for Breanna’s Gift was led by John Akre from Animation Station. John was assisted by Beth Peloff, and his artists and actors were the children at Ronald McDonald House Charities Upper Midwest. John brought out the best in his performers and the result is Aesop’s Fable, The North Wind and The Sun. Our first radio workshop was led by voice-over professional Beth Chaplin. It started out with kids learning about old time radio shows. Stories told without visual images. Just voices and sound effects using big microphones. They worked on the story of The Tortoise and the Hare. 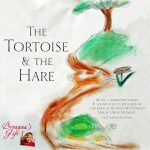 The final mix of The Tortoise and the Hare was presented to children who participated in a CD format so they can listen and imagine this classic tale with simply the sounds. Children participate in both the on- and off-stage experience, creating scenery, learning lines, practicing dances, practicing and rehearsing. Many of their performances – from Annie, The Sound of Music and The Wizard of Oz to Mary Poppins, have resulted in the very special “encores” that make everyone’s day. 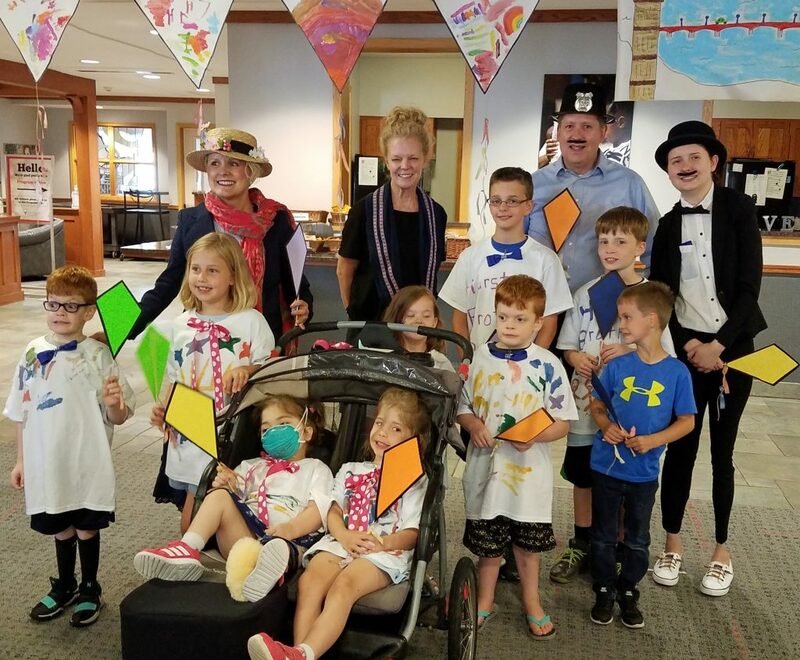 Margo McCreary leads our annual 3-day Puppet Workshop at Ronald McDonald House, which culminates in a performance that is scripted and performed by the children in our program, with highly improbable (but entertaining!) story lines. 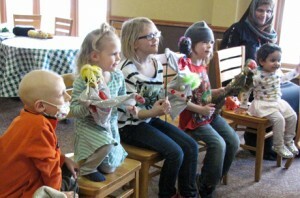 Margo has also produced live outdoor puppet shows that were performed outside of Ronald McDonald House and Children’s Minnesota hospital in Minneapolis. Star Studios, Children’s Minneapolis’ closed circuit TV program, simultaneously live streamed the performances to hospital rooms on both Minneapolis and St. Paul campuses. Our first Silent Film Workshop had children at Ronald McDonald House engaged for three mornings, and they learned three new words, “Lights, Camera, Action.” Their imaginations led to productions with heroes of all kinds, from Kings and Sorcerers in The Magician to our second production, Superheros on the Moon. 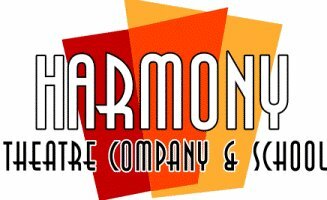 Harmony Theatre Company led both workshops and we can’t wait to collaborate again. 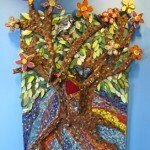 Mosaic Workshops led by mosaic artist Lori Greene take the word collaboration to new heights. Children and their families will often take part in creating the mosaic background for large pieces or work on smaller sections of a large mosaic piece or both. Mosaic art is a multi-step process and it takes a lot of patience and a lot of time to complete. Because of the scope and size of the projects, children participate as time allows and Lori takes it from there. The results are full of magical details and wonder. There is so much to see and it’s always fun for the children to look for the areas they worked on. It’s even more fun to watch them look for and find their names, which are always embedded in the art. 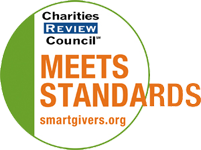 Two- and three-day workshops are sometimes designed with a donation in mind. A three-day summer artist workshop event with mosaic artist Lori Greene was so much fun. Twenty-three children, both patients and siblings, helped build our creation at Ronald McDonald House Upper Midwest. The mosaic was then completed by Lori and names of all 23 participants became an integral part of this vibrant and magical Tree of Life. The tree, which is 5 feet high and 3 feet wide, was our gift to Ronald McDonald House in honor of their 30th anniversary, and we are so proud to have been a part of their special celebration. 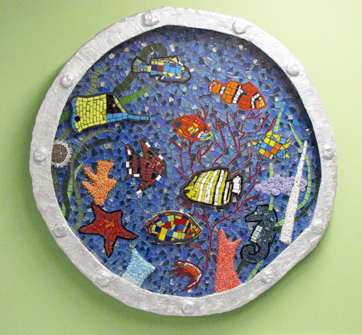 This mosaic of life under the water, You and Me Under the Sea, was also designed by Lori Greene. This unique art collaboration included our artist/patients, their parents and child life staff from the Minneapolis hematology/oncology unit of Children’s Minnesota. The children spent three afternoons creating starfish, shrimp, seahorses and of course we can’t forget Nemo. The children are very proud of their work and have been known to stop by when they can, to find their names on the frame and admire their art. Beth is a leading professional actor based in the Twin Cities. 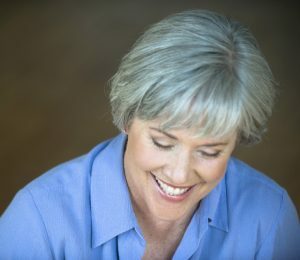 Her extensive voice-over/on-camera portfolio includes hundreds of radio and TV commercials and over a thousand industrial and corporate training programs to date. Beth has a knack for technical reads and can make even the most complicated copy sound clear and conversational. Her ability to interpret, adapt and translate any direction into an immediate result always keeps her clients coming back for more. Beth has also coached dozens of local actors in the business of acting, ear prompting, acting for the camera and voice-overs. Audiences have seen her on several local stages as well. From sound to screen, stage to student, Beth Chaplin wrote the book on voice acting and the business of acting in the Twin Cities. Oh wait, she really did! Purchase or find out more about Beth Chaplin’s award-winning book, The Acting Biz. Anne McNaughton attended Concordia College in Moorhead, Minnesota where she earned a B.A. in Business Administration. She continued her education at St. Thomas University in St. Paul, Minnesota, earning her M.A. in Education along with a French teaching degree. Anne has been a singer all of her life. She has 11 years of formal training, first while attending Concordia and later at MacPhail Center for Music in Minneapolis, Minnesota. Anne combined her singing with dance when she assisted and taught at Woodbury Dance Center in Woodbury, Minnesota. To her love of song and dance, Anne adds the third component of acting. She studied improvisational acting at Dudley Riggs’ Brave New Workshop in Minneapolis, Minnesota and put her skills to work acting in several productions while at Concordia and additionally performed every week for four years in the Six Ring Circus at the Brave New Workshop. She has also been in productions of Jesus Christ Superstar, Annie and The Sound of Music to name a few. Anne has directed and choreographed musical productions at Falcon Ridge Middle School in Apple Valley, Minnesota for many years. The shows include such musicals as Guys and Dolls, Oklahoma and High School Musical. 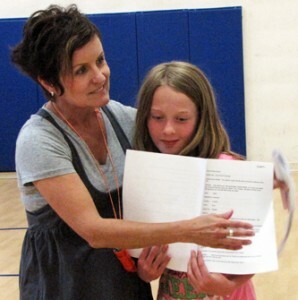 Five years ago she created and continues to direct drama camps for young children. Her camps introduce children to the world of theater through acting, dance, costume and scenery creation and performance. Starting in 2010, the drama camps for Breanna’s Gift have been held each summer at Ronald McDonald House Upper Midwest. Some of the repertoire includes scenes from Annie, The Sound of Music and The Wizard of Oz. Elena Khalitov is the founding executive director of Harmony Theater Company and School. A native of St. Petersburg, Russia, she has had a diverse career path, constantly devoting herself to helping other people in discovering their personal potential. Elena studied at the St. Petersburg State University in Russia and completed graduate studies at the University of Minnesota. She worked as a behavioral health therapist and has also taught at the Minnesota School of Business/Globe University and at Art Institutes International Minnesota. Since 2004, Elena has been leading Harmony’s educational programs and managing all of the company’s productions. Elena has co-created Harmony’s acting school program curriculum and the “Orbs of Power and Skills” system of student progress/evaluation. She has also been teaching classes, writing scripts, directing and co-directing Harmony’s stage shows. With Elena’s direction, Harmony has developed a unique curriculum that incorporates numerous acting games and professional theatre activities. The school and company have created many large stage productions, numerous improvisation shows and theatrical events and produced over 25 short films and documentaries. 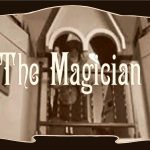 Elena and her staff began collaborating with Breanna’s Gift in 2014, teaching an improvisation theater class and leading silent film workshops with the children at Ronald McDonald House. Lori Greene received her BFA from California College of Arts and Crafts in 1982 and her MFA from Maryland Institute College of Art in 1993. 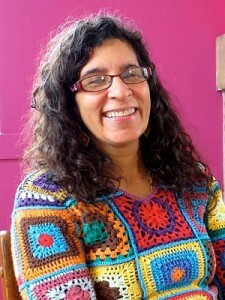 Lori’s work draws inspiration from African and traditional Native American culture. Both cultures are reflections of her ethnic heritage. Beginning in 1993, Lori received numerous grants and fellowships including 2 Bush Artist Fellowships awarded in 1994 and again in 2010. Her exhibitions are numerous as well. Exhibitions have been held at the Steinbaum Krauss Gallery in New York City, the Minnesota Mosaic Guild in Redwing, Minnesota and Mosaic Arts International in Miami, Florida in Phoenix, Arizona in 2007 and 2008 to name a few. Some of Lori’s commissioned works in Minnesota include mosaics for the Minnesota Cardiovascular Center, Chicanos Latinos Unidos en Servicio, Creek Valley Elementary School, Gillette Children’s Hospital, Fairview University Hospital, Breck School, Holy Spirit Chapel, and a mosaic mural for the Ramsey County Library. 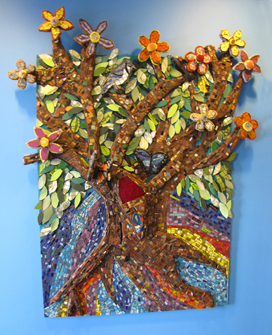 In 2004, Lori opened Mosaic on a Stick, a community art classroom and studio in St. Paul, Minnesota. Lori has shared her time and her talent, teaching adults and children at her studio and adds this community based environment to her several Artist in Residence commissions where she has worked with children as they step into the world of mosaic art. One of these special projects was The Tree of Life for Breanna’s Gift. 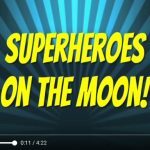 Held at Ronald McDonald House Upper Midwest, Lori and the children shared her beliefs regarding creating images that are about strength, power memory, protection and empowerment – about being all you can be. Another project for Breanna’s Gift was a mosaic collaboration with children in the hematology/oncology unit at Children’s Minnesota in Minneapolis. 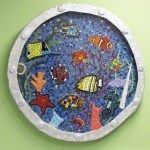 This piece, You and Me under the Sea, is on permanent display at the hospital. In 2015, Lori developed an Art TakeoutTM project for Breanna’s Gift called Make a Mosaic. These projects are for children who are too sick to join group classes.